The city of Mostar, Bosnia, proved to be colorful, flavorful, and packed with a richness of history. This is south-east Europe at its most captivating. Similar to Jerusalem with its hodgepodge of faiths living together, Mostar’s skyline showcases minarets and church steeples all reaching for the sky. Muslims (Bosniaks), Catholics (Croats), Orthodox Christians (Serbs), and a pocketful of Jewish families all call this spot of real estate home. 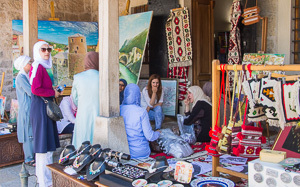 With such a kaleidoscope of exotic cultures and ancient faiths, you can easily envision the souks of Turkey or Morocco, forgetting that this is still Europe. The border of the Old Town starts at the cobblestone walkways. 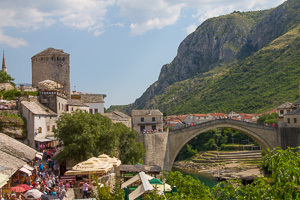 Like the Wizard of Oz’s Dorothy emerging from her black and white dream and tumbling into colorful munchkin land, this is where Mostar really heats up and gets treacherous, literally. Ditch the sandals you wanted to show off as this is tough and uneven terrain. Rainy weather turns the cobblestones slick, truly an accident waiting to happen. Same goes with the many Asian day-trippers carrying umbrellas, whether for sun or rain coverage. Someone always gets poked in the face or head in such narrow, clogged streets. 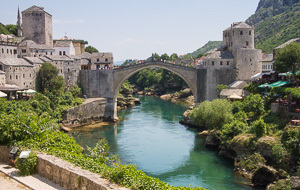 The iconic symbol and namesake for Mostar, its 16th century Old Bridge spanning the Neretva River, is lovingly called “him” by Bosnians of all faiths. The precursor in design to Venice’s Rialto Bridge, it’s a metaphoric symbol showcasing ways the diversity of cultures and religions were able to bridge the gaps that divided them. The war of the early ’90s brought the nations within old Yugoslavia struggling for their independence. The beloved Old Bridge found itself an unwilling casualty, caught in the crossfire, crumbling to pieces into the river below. Today’s Old Bridge, an exact rebuild using many of its original, salvageable stones, is a little over 10 years old. This new Old Bridge is both symbolic and literal, a bridging of east and west, a sign of reconciliation. A walk through the Old Town is not without a mental jolt, uneasiness not quickly ignored. The reminders of war 25 years past are very much in evidence, with bombed-out buildings here and there and bullet-hole-riddled facades of stone. To this westerner’s eyes, the biggest contrasts were not the brick and mortar, nor its war-torn history, but the diversity of Mostar’s women. Devoutly Muslim, yet 100% European, the ladies ran the gamut in dress, appearance, and features. Not as uniformly or conservatively dressed as their Muslim Arabian sisters, nor behind the scenes, but very much front and center in their town. One group of young women were enjoying tea, beautiful silk scarves barely covering their heads, and some not covered at all. No two women looked alike. I was surprised by a woman dressed head-to-toe in a traditional black niqab found more in Saudi Arabia than Europe, her eyes a beautiful shade of emerald green looking back at me. It wasn’t the head-to-foot covering which set her apart, but her neon purple sneakers poking out from the black “uniform.” None of the ladies were accompanied or escorted by a man. Very much a part of the tapestry of Mostar, they just went about their business. No one gave them a second look. No male eyes passed judgment. Nor did it seem that any of these ladies truly cared what others thought of their faith-inspired clothing. Me, I was more on the alert for the dangerous umbrellas.